We put the customer first. We’ve heard it (and probably said it) so many times it’s become a cliché. And yet, while we pay lip service to the idea, few companies truly put it into practice. The fact is, we’re so concerned with bottom lines, profit margins, and paying the bills (at work and at home!) that we instinctively put ourselves first. But as counterintuitive as it may seem, anxious sense of self-preservation may be exactly what’s holding you back. When you really put the customer first, and put your own needs second, a whole lot of other things naturally fall into place. Tough decisions practically make themselves. Since you’re no longer pitting the client’s needs against your own, relationships are based on transparency and honesty. People like and trust you, and referrals flow freely. If there is a magic bullet, putting clients first is it. It has the power to change your life, to transform your business, and to bring about financial security. I should know. My wife and I built our thriving business — Those Callaways — in a tough industry that’s had more than its share of challenges. JoAnn and I entered real estate in 1996 when interest rates were almost 9 percent. Since then, we have lived through a bubble and survived a horrible economic downturn — and managed to prosper through both, while many of our fellow realtors never recovered. We have sold over a billion dollars’ worth of homes. And we credit it all to our remarkable — and remarkably simple — discovery of putting clients first, whether they were individuals or institutions. Even through the darkest days, our clients kept calling our phones and coming to our open houses. They took care of us just as we had taken care of them. Step One: Make the Commitment. For many people, “commitment” is a scary word — and for good reason. It implies that you have accepted responsibility, that you are “locked in,” and (sometimes) that you have given up an aspect of your freedom. For all of those reasons, and many more, most commitments should not be taken lightly. But here’s the good news: Because sincere commitments require you to step up and take a stand, they often lead to great things. If you’re comfortable with your current level of success, are satisfied with the way you do things now, or don’t really have a desire to be more involved with your customers, Clients First is probably not for you. It goes against the grain of human nature. We instinctively focus on ourselves, not others. Saying ‘yes’ to Clients First will change the way you think and interact, and initially you might find this shift difficult! But in the end, I promise, your new way of doing business will make everything else easy. HOW-TO HINT: Give yourself a week to think it through before you decide. A no is better than a quick yes and a shallow commitment. Ask yourself, What will my life really look like when I put customers first? Will I have to work late more often? Take client calls at home? Have conversations that veer away from business and into “personal” territory? If you don’t like what you envision, don’t make the commitment. Step Two: Speak the Commitment. Step One — Make the Commitment — won’t ultimately mean much if you don’t share your intentions with others. If you say nothing, your commitment will begin to wither like a potted flower that isn’t watered. However, speaking your commitment gives you strength, and it’s instrumental in affirming (and reaffirming) to yourself what your goals are and why. HOW-TO HINT: If you get a negative reaction when you speak your commitment, channel David Letterman. The late-night TV host often reads jokes from index cards. If one happens to fall flat, he simply flicks the card away. This flicking gesture protects him from rejection. If someone dismisses your spoken commitment (or worse, mocks it), make a flicking gesture and move on. Step Three: Keep the Commitment. Some days, you’ll want to say, “To heck with this difficult person! He can fend for himself from now on!” Or you might just be so tired and overwhelmed that you’re tempted to cut some corners and let some non-priorities slide. You must try as hard as you can to resist the temptation. Clients First is something you must consciously recommit to every day. Remember, it’s usually not the big things that trip us up; it’s the little steps we miss. One day you let an aggravating client get to you, for example, and the next you’re pre-judging a walk in. Eventually, though, keeping your commitment to Clients First becomes easier. It’s a habit that will become hardwired into your life. And by that point, the benefits, rewards, satisfaction, and success will be rolling in — and you’ll be proud of the person you’ve become. HOW-TO HINT: Remember the Napoleon Hill story from his classic Think and Grow Rich. A miner worked a claim for years before eventually giving up and going back home. A few years later an amateur visiting the area found a pickax and gave a promising wall a try. In less than an hour, he discovered one of the West’s richest strikes. Don’t stop Three Feet from Gold! Step Four: Get Yourself Out of the Way. When it comes to being successful, having a healthy ego can be a blessing and a curse. Yes, you need a strong sense of self in order to avoid being trampled on and marginalized by competitors and by clients. But when you start to believe that winning, recognition, and accolades are “the point” of what you do, you’ve veered off onto a destructive path. Everybody is different, and everybody will develop different ways to redirect their egos. What’s crucial is that it happens; that you get out of your own way. Remember, your job is to be a champion for your clients, to solve their problems and find them satisfying solutions. Your job is not to be the most important person in the room or to put others down. Believe me, when you take care of your clients first and foremost, they will take care of you through their loyalty and appreciation. HOW-TO HINT: Notice how often you bring the story around to yourself. Stop doing that. Many people think building rapport is a matter of finding a common interest. They then dominate the common interest discussion by talking about themselves. Don’t. This is a form of arrogance and it takes your focus off the client. Step Five: Set the Monkey Down. …the monkey that’s riding your back in the form of responsibility and pressure, that is! If you’re like most people, you probably feel burdened with a myriad of worries, fears, and obligations. You assume that “it’s all up to me,” and you might even lie awake at night fretting over what isn’t right and what could go wrong. However, if you want to successfully care for your clients, you can’t be expending the majority of your mental energy on yourself. I’m not saying that putting the monkey down is an easy or instantaneous process. Far from it. It’s challenging to break what’s often a lifetime’s worth of mental habits. But here’s the beauty of Clients First: Success is no longer about you; it’s about your customers. Your challenge is to only do the best for your clients. It’s a win-win situation, because the clients put their faith in you and you put your faith in doing your best for them. In our experience, everything else usually works out for the best. HOW-TO HINT: Every time you find yourself fretting, do something for a client. Spend an hour solving a client problem you’ve been avoiding. Connect one client to another who might be able to help him. Email him a link to an article you know would interest him. Worry thrives when you procrastinate and handwring. Action is the antidote…so do something (anything) to back up your commitment to your clients. Step Six: Put Your Faith in Others. Yes, putting your faith in others can sometimes be a leap of faith. Sometimes you will be left holding the bag, and there’s nothing you can do about it. But more often, you’ll have opened yourself up to winning in a situation where reluctance might have caused you to fail. The second aspect of putting your faith in others is allowing them to help you by delegating tasks or leveraging others’ talents. No matter how good you are, you can’t do it all. And when you trust others and give them the freedom they need to do their jobs, you’ll usually be pleased with the results. HOW-TO HINT: Practice going first. The next time you find yourself in a position to serve someone—a boss, an employee, a client—take the leap. Don’t wait for them to do something for you. Don’t think about what you’re going to get in return. Don’t ask yourself if the person “deserves” it. Going first is a way of putting your faith into action. Your faith will be repaid. Miracles will drop from the sky. Step Seven: Trust the Truth. If someone accused you of not being honest, you’d probably have the same reaction we did before discovering Clients First: “How can you even ask that? Of course I’m honest!” And by most people’s standards, you probably are. But it’s also likely that you aren’t being totally, completely authentic in the way you handle relationships and do business. Before deciding to put clients first, JoAnn and I didn’t always trust the truth. We feared consequences. We feared not being in control. We tried to make things happen according to our plans, we held back, and we sought to manipulate — all with the best of intentions. Now things are different. We trust the truth that Clients First is best for everyone, and our definition of honesty changed. We feel it, and our clients feel it too. They’ll say, There is someone who will take care of me, tell me the truth, and put me first. They know we aren’t going to pull punches or hold anything back. HOW-TO HINT: You know that thing you’ve been wanting to say for a long time? Go ahead and say it. Don’t worry about the fallout. Bravely take the leap. You’ll find that most people want the truth. Give it to them and you’ll be joined together in a bond that never betrays. Step Eight: Let the Work Be the Reward. In the real world (and especially in a tough economy), you can’t always follow the popular graduation day advice and “do what you love.” But what you can do, regardless of how you spend your nine-to-five hours, is choose to take pride in your work. When you consciously decide to put forth your best efforts, you’ll experience greater rewards and you’ll get better at what you do! HOW-TO HINT: At least once a year, do something that will help you get better at your job. Maybe it’s going to a seminar. Maybe it’s asking the client how you can serve him better. Maybe it’s shutting down your email so you can better concentrate on the task at hand. The better you get at what you do, the more rewarding it will be. Step Nine: Learn to Like People. Even if you already consider yourself to be a people person, chances are you still need to learn to like them more. Think about it: Do you see your clients as business opportunities and sources of income, or do you see them as actual human beings with likes, preferences, quirks, and stories? To truly put clients first, your number one goal at each meeting should be to invite them within arms’ length and make them less of a stranger. People want to do business with individuals they like — and they like people who like them! Now I’ll admit — sometimes it’s not easy to like people. They can be difficult or have bad attitudes, and they can be a source of pain, ridicule, and embarrassment. But if you get out there and engage, you’ll find that most of them are just like you: filled with worries, hopes, and dreams. HOW-TO HINT: Every time you meet with a client, ask at least one question that has nothing to do with business. Ask about their kids. Ask about their pets. Ask about their favorite food, or movie, or vintage car. The conversation will likely develop in a surprising direction. As you hear their stories and get to know their joys and sorrows, you’ll start liking them. And you’ll find it more natural to put them first as clients. Step Ten: Turn It Around. You, not the customer, are the expert on your business. You are the one who knows how to sell real estate or market a product or properly install a heat pump. But does that mean that yours is the only opinion that matters? Of course not. No matter what industry you’re in, you need to turn your viewpoint around and make a sincere effort to see yourself and your business as your client does. I once worked with a vendor who asked me to help him develop advertisements for his home-cleaning business. The problem was, he would consider only ads modeled after his favorite sports team’s branding. He didn’t care that not all potential customers were sports fans, or that they might root for a different team. And as a result, his business hasn’t grown much. Don’t make this man’s mistake. Don’t make your business all about you. Think about what your clients want and figure out how to give it to them. Bottom line: When you turn it around and put yourself in the client’s shoes, you put the client first. HOW-TO HINT: Call up an ex-client and ask her how she sees your business. Assure her up-front that your goal is not to win her back. You just want the truth about how she perceives you and the truth about what she as a customer really wanted from you. If you are willing to do this (and make no mistake, it’s hard), you’ll learn a lot about what needs to change. Step Eleven: Give to Get. We’ve all heard the expression, “The more you give, the more you get.” And we understand its meaning when it comes to things like love, smiles, and kindness. But how does it relate to business? Well, you can give your clients honesty, competence, and care, and hope to get those things back. But if you give away your expertise, time, energy, and (gasp!) money, won’t you just go broke? Not necessarily. I remember being very apprehensive about donating a large sum of money to build a Habitat for Humanity house as a Christmas gift for our clients. I thought I’d never see that money again. But in the years since, I’ve learned that new clients chose us — and even that a bank gave us all of their foreclosures to sell — because they had learned of that donation. Now, you might not always give and get on such a large scale. But the principle works for all amounts of money, and it also works when you’re giving over-and-beyond service. Understand that giving to get isn’t like a financial transaction where you give and get right there and then. There is no up-front agreement on what you’ll receive or when you’ll receive it. It may take time. But rest assured, whatever you give will come back to you with interest. HOW-TO HINT: Look for something to give away. (And don’t be cheap about it!) Whether you give free popcorn to moviegoers or a free grooming to pet boarding clients or a gorgeous framed print to your interior design clients, you make them feel special. This will keep them coming back. As you’re implementing each step, remember that Clients First — like life itself — isn’t so much a destination as it is a journey. If you commit to it, Clients First is a path you’ll be traveling for the rest of your life. It will fill you with pride, clarify your perspective, and promote your business’s prosperity. Most of all, your clients will love you for it — and you will love them! 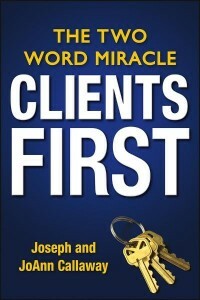 Joseph Callaway and JoAnn Callaway are coauthors of “Clients First: The Two Word Miracle” and founders of the real estate company Those Callaways.